Country living at its best is found at Myakka Valley Ranches in Sarasota. With lot sizes ranging from two to twenty acres, there is plenty of room to spread out or even a chance to pursue equestrian endeavors. 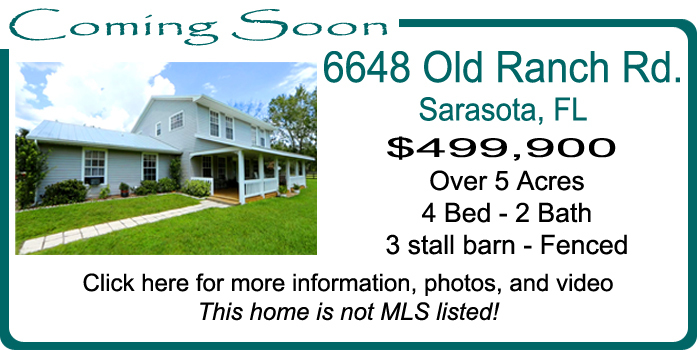 Located just 10 minutes east of I-75 off Clark Road, home may be in a rural setting but not so remote as to be away from everything Sarasota has to offer. Just 20 minutes further puts you into downtown, St. Armand’s Circle or the world class white sand beaches at Siesta Key. Every home is a custom build home ranging from 1,200 to just over 6,000 square feet with the earliest construction beginning in the early ‘70’s and running up to current day. There are just fewer than 20 of the 295 home-sites that are ready for a new home to be built your liking. Many of the home-sites already have barn facilities and board fencing. Of course there are no deed restrictions. Expect quiet nights. When the sun goes down, the stars come out. Keeping up on the Myakka Valley Ranches real estate market has never been easier. If you are looking for acreage for horses or just want a setting that doesn’t include seeing your neighbor, registered buyers and sellers get almost real-time updates as to new listings, price changes, and sales. Our market report is a great decision making help by giving you an instant view of market variables and flow. We updated all of our MLS data several times an hour so you know the information here is as updated as possible. We have been selling Sarasota spanning over two decades and look forward to helping your next real estate purchase or sale be rewarding and successful. Call us. We would like to show you how you will be glad that you did.